“Itsy Bitsy Spider” plays softly as parents step into the gleaming lobby at Educare, an early childhood education center that opened in 2013 in New Orleans. On this particular day, the spider might want to give up on the waterspout and find a leaf to huddle under. Rain from Hurricane Harvey’s outer reaches lashes at the floor-to-ceiling windows. But in an infant-toddler room just down the hall, dispositions are sunny. Three teachers and eight children are on the rug, engaged in the all-consuming business of using words to build developing brains. To either side, her co-teachers are helping other toddlers find their tummies. In a few minutes, the kids will be busy making pictures of themselves. If Educare can hang onto these children, they will enroll in kindergarten as ready to learn as their wealthy peers, longitudinal research done by the center’s parent organization shows. All five preschool years — Educare’s program encompasses from birth to age 5 — is best, but even two has a measurable, long-term effect. And the earlier, the better developmentally, says Keith Liederman, CEO of the social service provider Kingsley House, one of the groups that joined forces to get an Educare in New Orleans. Other research backs this assertion. A study released this week found that the children of parents who lived in communities with Head Start preschool programs graduate from both high school and college in higher numbers, among other positive factors. And past studies of Educare-like programs in the 1970s showed lasting benefits from very-high-caliber early care. Educare is known as the gold standard as far as quality in early education, and ongoing studies of its results are expected to add to existing research that suggests the socioeconomic achievement gap can be prevented from ever opening if a child gets the right care from birth to age 3. It’s expensive — $18,000 a year per child at the New Orleans center — but research also shows the benefits remain as students advance through school. And economists have put the “return on investment” for every tax dollar spent on high quality care at 16 to 1. The money that makes all of this possible is a complicated proposition, which boils down to what early childhood advocates refer to as “braided funding.” Different pots of local, state, and federal money are added up, with a community’s Head Start and Early Head Start funds laying a floor by funding 50 percent to 60 percent of operations. Parents sometimes make co-pays, and private philanthropy picks up the slack. The tummy talk occupying Educare’s youngest children doesn’t look like brain science, but it is. During the first three years of life, a baby’s brain is shaped in part by experience. Trauma — poverty, homelessness, parental addiction, or unmet mental health needs in the home — has a negative impact on this process. And the impact is cumulative: Each adverse childhood experience, or ACE, as the development experts describe these toxic stresses, takes its own toll. Meanwhile, a steady diet of reliable care and engaging stimuli strengthens the brain’s neural net. Exposure to language, in particular, has a dramatic, positive impact, bolstering synapses the way weight-lifting builds muscles. Some studies put the “word gap” that typically separates impoverished children and wealthy ones by kindergarten at 30 million. With their animated faces and exaggerated reactions, the teachers here are deliberate in the way they talk to their tiny pupils. As the kids learn to talk, a teacher will follow a one- or two-word exchange with a question that invites an answer that uses more words. When a child turns away and shows interest in a different toy or activity, they may narrate the story of what the boy or girl is doing. Through a combination of required volunteer hours and events, Educare parents are exposed to ways of promoting their children’s development at home. Family liaisons help the adults set goals of their own and also facilitate education on everything from financial literacy to wellness. There’s a concerted push to get adult men to events. Both boys have autism, something many preschools struggle to accommodate. By contrast, Educare is able to provide the ABA (Applied Behavior Analysis) therapy the boys require and has a family advocate dedicated to the needs of children with disabilities. “My older twin is a little bit of an introvert, and they work really hard to find ways to help him come out of his shell,” says Dunams. The center serves just 163 children, but a key part of its mission is to train caregivers and preschool teachers throughout the Gulf Coast. And to serve as a vivid proof point to its continual roster of visitors that quality is a path out of poverty. Like the other 21 Educare sites throughout the country, the goal at the New Orleans facility is to enroll the children who live below the federal poverty line — less than $25,000 for a family of four in 2017 — who are most likely to have experienced the most stresses and to pour on developmental stimuli. With the second decade of New Orleans’s unprecedented schools reboot well underway, educators and policymakers are taking stock of challenges they have yet to meet. Briefly sketched, in the 12 years since Hurricane Katrina damaged or destroyed 100 of the city’s schools, the school system has gone from the equivalent of an F grade on state report cards to a C.
In other words, it’s gone from being a nation-leading study in failure to one of the dozens of urban U.S. school systems where results are persistent and ultimately unacceptable. To get from a C to an A will take concerted efforts on a number of fronts, Orleans Parish School Board members and education policymakers say. But if there were one thing that would make a profound and immediate impact tomorrow, those leaders say, it would be finding a way to make high-quality early childhood education available to every low-income family. New Orleans is home to 23,000 children 4 and under. More than 42 percent live in poverty, and virtually all of them will continue on to the public school system, where impoverished children make up 85 percent of the student body. There are 5,200 publicly subsidized preschool seats in the city, but they aren’t evenly distributed. Thanks in part to an Obama administration push to expand pre-K, many New Orleans schools are adding classrooms for 4-year-olds. This leaves just 335 4-year-olds without access to a publicly funded preschool, according to a 2017 report by Agenda for Children, a nonprofit leading the early ed push. By contrast, nearly 11,000 of the 13,000 children ages 0-3 have no access to affordable or subsidized care — despite a well of evidence that those are the years when every dollar spent on quality early education makes the biggest difference. “From that point on, it’s all about remediation, it’s all about plugging gaps and making up skills,” says Educare Center Director Angelique Shorty-Belisle, who taught at the public school that used to be down the street from the center before the storm. As they look ahead, leaders of New Orleans’s K-12 education landscape have an intimate understanding of how hard it is to close achievement gaps for older students. When it comes from moving schools from C to A, having children show up for kindergarten as ready as their affluent peers would be huge. 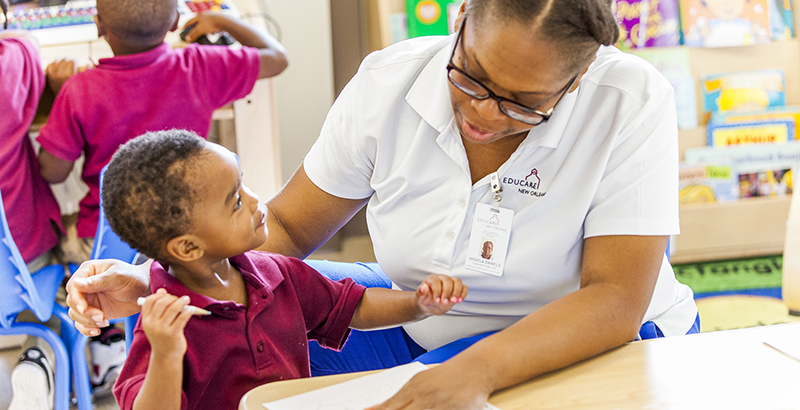 Within months of its opening in October 2013, leaders at Educare’s New Orleans facility realized they were seeing signs of mental health issues at home in very young children. Given the recent history of the city, and in particular of the neighborhood where the center is located, they weren’t surprised. In 2005, Katrina left the St. Bernard Housing Community under more than eight feet of water. More than half its 5,800 displaced residents were children. The city’s second-largest public housing project, St. Bernard was unfit to live in even before the storm. One-third of its 1,400 units were boarded up and the rest crumbling. In the four years before Katrina, 700 felony crimes were committed, including 42 murders. Some of the brick walls inside Educare’s $9 million center are left over from St. Bernard’s row houses. The hallways they frame are airy and orderly. The building itself sits at the center of a mixed-income redevelopment where a number of units are reserved for families displaced by the storm. A longtime Head Start provider, Kingsley House did extensive research to determine the type of early childhood program that should be part of the reconstruction and then worked to secure the multiple sources of funding necessary to meet the cost. 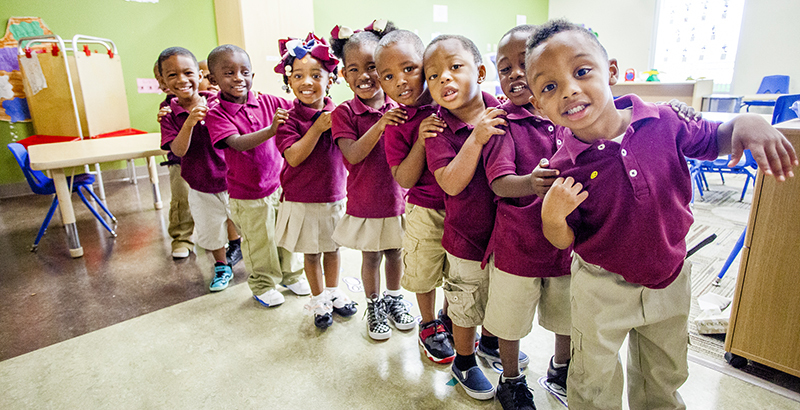 The organization now spearheads the public-private partnership behind Educare New Orleans. Other partners include the Bayou District Foundation, Total Community Action, and the city’s housing authority. The delicate financial structure could topple, Liederman warns, if the hundreds of millions of dollars in cuts to federal preschool funding President Donald Trump has proposed make it through Congress. With the budget tussle stretching on for months, it’s hard to plan for long-term stability. And even if federal funding is left intact, there are the nearly 11,000 impoverished children ages 3 and younger who lack quality subsidized care. 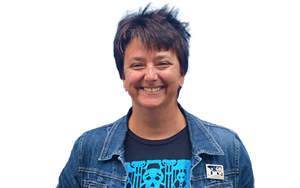 Several organizations have teamed up to begin considering what a comprehensive public network would look like, says Deirdre Johnson Burel, program officer for the W.K. Kellogg Foundation, which funds a number of early education initiatives in New Orleans. The New Orleans Early Education Network includes the foundation, advocacy organizations, childcare providers, and the Orleans Parish School Board, which by the end of next year will oversee all of the city’s public schools. The questions on the table are many, says Johnson Burel. Parents love the addition of 4-year-old classrooms to their desired school, with its free transportation and guarantee of a kindergarten seat. But early ed and K-12 are very different things; are public schools best equipped to serve the younger kids developmentally? Because child-to-caregiver ratios are higher for 4-year-olds than infants and toddlers, private childcare providers rely on a certain number of them to “calibrate” their budgets. If public pre-K takes those 4-year-olds out of the equation, that means a hit to their wallets. How can the system help the 0–3 centers maintain quality? The network has launched a universal enrollment system not unlike OneApp, the centralized application hub that now encompasses most K-12 schools in New Orleans. Not only is the system expected to help match needy kids with open 0–3 seats, its documented wait list likely will serve as a potent talking point for advocates pushing for an institutional home for early education — and money to fund it. Saja Farhood learned about Educare from OneApp. She was thrilled to learn there was a five-star-rated center about a block from her house and relieved when the oldest of her two children was admitted two years ago. After two years in the program, she says her 4-year-old son, Fethi Judeh, already knows all of his sight words — a goal children are typically expected to meet by the end of kindergarten. There is one more bit of magic that happens inside Educare New Orleans, says Shorty-Belisle, the director. Because chances are high that the next stages of their children’s education won’t be as exceptional, parents need to be taught what high standards look like. And what better place for a parent to learn to both collaborate with their child’s teachers and hold them accountable?